‘Leaky gut’ is gaining more attention by the day. This is because various diseases are increasingly associated with the state of our gut. Increased intestinal permeability, also known as ‘leaky gut,’ can trigger autoimmune diseases, chronic fatigue syndrome, allergies, and even depression. In this post, you will learn more about the intestinal barrier, factors that disrupt it, and ways in which you can heal a leaky gut. What is the Intestinal Barrier? The main function of the gut is to absorb nutrients from the food. However, the gut also has another important function – to keep harmful things such as bacteria (good as well as harmful), toxins, and food antigens (inflammatory agents) out and away from the rest of the body [R]. This barrier basically separates the gut content from the body. It is made of a single layer of cells (epithelial cells, sensing cells, and cells that produce enzymes and neurotransmitters). These cells are linked by tight junction (TJ) proteins [R]. The intestinal/gut barrier covers a surface of about 400 m2. It uses approximately 40% of the body’s energy expenditure and it is renewed approximately every 5 days [R]. When there are abnormalities in the intestinal barrier, the intestinal permeability increases. This means more of the gut content can pass/leak through, which is referred to as “leaky gut” [R]. When the gut is leaky, gut bacteria and their products can escape the gut, which can produce inflammation and cause tissue damage [R]. Also, food-derived antigens (proteins or partially digested proteins) can pass through the gut and promote both local or whole-body immune responses [R]. Zonulin is a protein that causes tight junctions to open. When tight junctions open, intestinal permeability increases. Bacteria and gluten are examples of agents that can cause ‘leaky gut’ by increasing zonulin [R, R]. Zonulin levels may be a measure of paracellular (between cell) gut permeability. This test has been used the longest in both human and animal studies [R]. Lactulose and mannitol are sugars that aren’t broken down in the digestive tract. Mannitol is smaller and gets absorbed through the gut. Lactulose is larger and is only absorbed if there is increased intestinal permeability [R]. Levels of lactulose vs. mannitol can then be measured in the urine [R]. Note that decreased gut flow and kidney dysfunction can affect the results. The test is also unsuitable in patients on blood transfusion since mannitol is used in the storage solution of banked blood [R]. Zonulin is a protein that causes tight junctions to open. More zonulin means higher intestinal permeability. It is a good marker for leaky gut and autoimmune diseases that are caused by the zonulin pathway [R, R]. Blood tests for zonulin are now available. With an intact gut, the immune system should not be exposed to the gut content. Therefore there shouldn’t be a lot of antibodies against foods. By inference, if you have a lot of antibodies against various foods, you likely have some intestinal permeability. For example, pregnant women who ate more healthily (more omega-3 fatty acids, fiber, vitamins, and minerals) had a lower intestinal permeability (measured by zonulin) [R]. A high-fat diet increases gut permeability by reducing tight junction protein production in mice [R]. Lectins are proteins that are especially concentrated in seeds (grains, legumes, nuts) and tubers (potatoes). Lectins can be beneficial by stimulating the immune system. However, they can also bind to the surface of gut-lining cells and disturb the gut barrier [R]. When lectins cause leaky gut, both dietary and bacterial antigens (inflammatory agents) leak into the blood and activate the immune system [R, R, R, R]. Some dietary sources of lectins, such as wheat, can directly open tight junctions in gut cells (by increasing zonulin) [R]. Stress hormones from the HPA axis, such as CRH, can increase intestinal permeability and cause inflammation [R, R]. In 23 healthy volunteers, stress from giving a public speech increased gut permeability (via CRH) in those who also had increased cortisol [R]. Maternal separation and other types of stress increase intestinal permeability in rats [R, R]. Rats who experienced maternal separation in youth are also more prone to the leaky gut when they experience social stress as adults [R]. Twenty-nine intensive care patients showed increased intestinal permeability 72 to 96 hours after trauma. The more severe the injury, the greater the increase in gut permeability [R]. Also, intensive care patients with a large increase in intestinal permeability are at more risk of whole-body inflammation, multiple organ dysfunction, and infections [R]. Burn injuries caused leaky gut in both animals and humans [R]. Mice with burn injuries had disturbed microbiota (particularly a deficiency of butyrate-producing bacteria) and increased gut permeability [R]. Mice and rats with traumatic brain injuries also had increased intestinal permeability [R, R]. Exercise can increase intestinal permeability. While we exercise, blood goes into the muscles and away from the stomach, and the supply of oxygen to the gut is reduced. When the blood supply to the gut is reduced by more than half, intestinal permeability increases. For reference, people exercising at 70% maximum capacity have a 60 to 70% reduced blood flow to the gut. At 100% of maximum capacity, the blood flow is reduced by 80% [R]. People who exercise at high intensities for longer periods have compromised gut barrier integrity. This puts them at a greater risk of chronic inflammation and diseases [R]. Running at 70% capacity increased intestinal permeability in 20 athletes, which is more pronounced in those who also already suffer from gut-related symptoms [R]. Cycling at 70% capacity increased gut leakiness and the number of allergens reaching the bloodstream in 10 people [R]. Soldiers in high-intensity combat training had increased gut permeability as well as the incidence and severity of gut-related symptoms [R, R]. However, in 11 well-trained athletes, the gut adapted to exercise. As a result, the intestinal permeability was not affected [R]. This suggests your gut barrier can be ‘trained’ as well as your muscles. Alcohol can disrupt intestinal barrier function and increase gut permeability [R]. Alcoholics have higher gut permeability up to 4 days after drinking, sometimes even for up to 2 weeks [R]. One week of moderate consumption of red wine is safe in healthy people. However, it increased intestinal permeability in 14 patients with inactive IBD [R]. Some harmful bacteria, including E. coli, produce alcohol, which may be how these bacteria compromise the gut barrier function [R]. The intestinal barrier acts as a shield that can be modified by gut bacteria [R]. Disturbances in the gut microbiota cause gut barrier dysfunction in various disorders and diseases [R]. A study of 100 overweight pregnant women showed that those with leaky gut (high zonulin) had a lower diversity of gut bacteria [R]. Many harmful bacteria gain access to the body by altering tight junctions to increase gut permeability [R]. H. pylori directly increase gut permeability by acting on tight junction proteins [R, R]. Patients with malaria have increased intestinal permeability [R]. Tapeworm parasites caused leaky gut in rats [R]. Candida increased gut permeability (cell-based study) [R]. Inflammation increases intestinal permeability through TNF-alpha, IL-1beta, IFN-gamma, Nf-KB, and other cytokines [R, R, R, R]. Conventional NSAIDs increase gut permeability within 24 hours of ingestion. This is especially evident when they are taken long-term [R, R, R, R, R]. Stomach acid-suppressing drugs (PPI) also increase gut permeability [R, R]. However, in patients with cystic fibrosis, PPIs seem to reduce gut permeability [R]. Zinc plays an important role in maintaining the intestinal barrier [R, R, R]. Perturbed zinc balance is associated with abnormal gut permeability in children [R]. A study on 28 healthy female volunteers showed that vitamin C may increase intestinal permeability and that this effect is additive when added to aspirin [R]. A study of 153 children showed that iron supplementation increased intestinal permeability [R]. Circadian rhythms are important for the maintenance of the intestinal barrier [R]. A study of 22-night workers showed that they are more prone to alcohol-induced leaky gut [R]. Circadian disruptions, by either genetics or environmental cues, caused gut leakiness in mice. These mice were also more susceptible to further gut damage by alcohol [R, R]. Exposure to radiation, such as in radiation therapy, increases intestinal permeability in humans [R, R]. Radiation rapidly disrupted tight junctions in mice and increased gut permeability in monkeys [R, R]. Chemotherapy increases intestinal permeability; however, the exact mechanism is still not fully understood [R, R, R, R]. Babies naturally have a more leaky gut, which allows them to absorb immune substances from the mother’s milk [R]. Preterm babies have a more leaky gut than full-term during the first 2 days of life [R, R]. Infants fed with formula had a more leaky gut than breastfed infants [R]. A study on 62 preterm infants showed that those fed mostly human milk (>75%) had lower gut permeability than those receiving either low amounts or no human milk (<25%) [R]. The intestinal barrier may weaken as we age. Gut permeability (measured by zonulin) is higher in older people [R]. In 18 elderly people, high gut permeability was associated with higher TNF-alpha and IL-6. It was also associated with lower muscle strength and less habitual physical activity [R]. However, a study on 215 adults suggested that the gut barrier does not deteriorate with age per se. Instead, it deteriorated due to chronic inflammation and minor diseases that get more common as we age [R]. A dysfunctional intestinal barrier is an important cause of autoimmune disorders [R]. 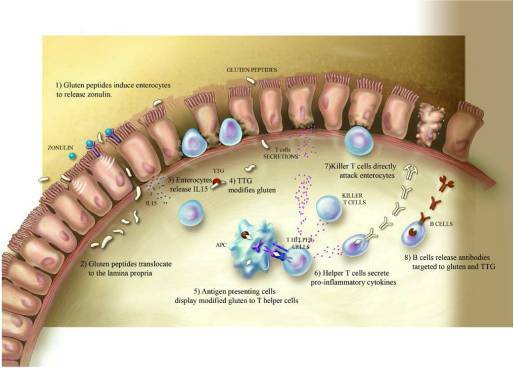 Leaky gut can be a source of the whole-body immune activation and Th17/Treg cell imbalance seen in autoimmune diseases [R]. Less than 10% of the people who are genetically susceptible to autoimmune disease, actually develop the diseases [R]. This means that environmental factors are much more important in autoimmune disease development. In genetically predisposed people, a leaky gut allows foreign inflammatory agents to enter the body. Then, these agents trigger the initiation and development of the autoimmune disease [R]. Blocking zonulin, a protein that opens tight junctions can reduce intestinal permeability. It can also reverse type 1 diabetes in rats and prevent leaky gut in celiac patients exposed to gluten [R, R, R]. A study (DB-RCT) of 342 adults showed that larazotide, a drug that blocks zonulin, reduced signs and symptoms in celiac disease patients [R]. IBD patients have a disrupted intestinal barrier [R, R]. In 110 patients with IBD, impaired intestinal permeability was associated with ongoing bowel symptoms. Increases in permeability correlated with more severe diarrhea [R]. Intestinal permeability is increased in most patients with Crohn’s disease. However, it is also increased by 30% of their healthy relatives (223 healthy subjects) [R]. The ‘gut leakiness’ in Crohn’s patients and their relatives can be further greatly increased by aspirin [R]. A therapy that blocks TNF-alpha, an inflammation-promoting cytokine, restored intestinal permeability in 23 Crohn’s disease patients [R]. Patients with IBS have increased gut permeability [R, R]. When 36 IBS patients with suspected food intolerance ate the food in question, it immediately disrupted their intestinal barrier, as compared to controls [R]. Increased gut permeability is also a likely cause of the severe fatigue and brain fog in patients with chronic fatigue syndrome [R, R]. A study of 41 patients with chronic fatigue syndrome showed improvement in more than half when they took supplements that help gut barrier function (such as glutamine and zinc) [R]. A study of 112 people with depression (and 28 controls) showed they have increased antibodies against gut bacteria, suggesting a ‘leaky gut’ [R, R]. A study of 60 alcoholic subjects with leaky gut showed that they are more prone to depression and anxiety [R]. Some studies (53 patients and 73 controls) showed that intestinal permeability is higher in those with autism [R, R]. In fact, both those with autism and their first-degree relatives are more likely to have higher intestinal permeability [R]. Patients with autism on a gluten-free, casein-free diet had lower gut permeability than those on unrestricted diets [R]. However, 2 other studies (140 subjects) found no abnormal intestinal permeability in autistic children [R, R]. A study of 41 patients with food allergies or food sensitivities showed that they have increased gut permeability. In fact, those with higher intestinal permeability have more severe symptoms [R]. Those with food allergies have leaky gut after eating trigger foods. However, their gut permeability was also increased at baseline, when they were on elimination diets [R, R, R]. A study of 131 allergic children on elimination diets with no symptoms showed that about a third had increased gut permeability [R]. Gut permeability is higher in people with both allergic and nonallergic asthma [R, R]. Another study on 14 patients with moderate to severe asthma showed that half had abnormal intestinal permeability [R]. Increased intestinal permeability may be one reason for trouble with acne [R, R]. A study of 15 patients with psoriasis showed higher intestinal permeability than controls [R]. A study of 18 people with eczema revealed a compromised intestinal barrier regardless if they had food allergies or not [R]. Obese people have leaky guts. Two studies, one with 40 and one with 55 subjects, showed that those with larger waists and worse metabolic parameters had higher gut permeability [R, R]. Higher gut permeability is associated with higher BMI, increased inflammation (IL-6), and lower insulin sensitivity (123 men) [R]. Leaky gut is a risk factor for type 2 diabetes (130 people with diabetes and 161 controls) [R]. Increased gut permeability (high zonulin) is associated with pregnancy-induced diabetes (88 pregnant women) [R]. Intestinal permeability is increased in children with fatty liver. Those with higher permeability have more severe disease symptoms (39 patients and 21 controls) [R]. Patients with liver cirrhosis have increased intestinal permeability and intestinal barrier dysfunction [R]. Not all heavy drinkers develop a chronic liver injury. A leaky gut may be a necessary factor for the development of chronic liver injury among heavy drinkers [R]. Patients with obstructive sleep apnea have a higher risk of having leaky gut (38 patients and 38 controls) [R]. Patients with acute myeloid leukemia (16 patients) and patients with breast cancer (10 patients and 22 controls) had increased intestinal permeability [R, R]. Increased tight junction permeability precedes the development of colon cancer in rats [R]. In cancer-prone mice, a high-fat diet disrupted gap junction proteins, thereby increasing gut permeability. This led to increased inflammation and development of tumors [R]. You can avoid and repair leaky gut by making lifestyle modifications. This means avoiding triggers like gluten, alcohol, NSAIDs, stress, and intense physical activity [R]. Lectins can cause leaky gut. The leaky gut then allows more of the dietary and bacterial antigens (inflammatory agents) to come in contact with the immune system [R, R]. If you feel you are lectin sensitive, it is best to avoid lectin-rich foods and any other food you are sensitive to. This means you should eliminate sugars, starches, grains, and other irritating foods. You can read more about lectins and lectin avoidance diet here. It is important to maintain a healthy balance of unsaturated vs. saturated fats, but also omega-3 vs. omega-6 fatty acids. Western diets typically have an excess of omega-6 and not enough omega-3 fatty acids. Mice on a high omega-6 diet developed abnormal gut permeability and chronic low-grade inflammation [R]. On the other hand, mice that received more omega-3 fatty acids had decreased intestinal permeability. Their gut lining also sustained less damage in chemotherapy [R]. DHA, a long-chain omega-3 fatty acid, improved barrier function in mice with gut inflammation [R]. Fermented dairy and vegetables are excellent sources of beneficial bacteria. These include yogurt, kefir, sauerkraut, and kimchi. Yogurt improves intestinal barrier by increasing tight junctions [R]. Yogurt with probiotics prevented the disruption of the intestinal barrier in rats with gut inflammation [R]. Fermented barley and soybean prevented gut barrier dysfunction in mice with IBD-like gut inflammation by increasing tight junction proteins [R]. Fermented soy germ extract also decreased gut permeability in rats with IBD-like inflammation [R]. Finally, kimchi-derived bacteria increased tight junction protein levels in mice [R]. Broccoli sprouts protect the intestinal barrier (tested on human cells) [R]. Sulforaphane, found in high amounts in broccoli sprouts, strengthened the gut barrier in mice [R]. Much of the emerging research shows that stress increases intestinal permeability [R, R, R]. Managing stress levels is a great way to improve the function of your intestinal barrier and your overall health. A healthy circadian rhythm will also help keep your gut healthy [R]. Alcohol increases intestinal permeability and is best avoided [R, R, R]. Even moderate consumption can increase intestinal permeability in susceptible people [R]. Non-impact exercise, such as swimming, can be beneficial in moderation. Swimming increased tight junction protein levels in rats [R]. In mice, 30 minutes of swimming per day maintained low intestinal permeability. It also prevented chronic stress-induced gut barrier dysfunction [R]. Whenever possible, avoid NSAIDs and proton pump inhibitors [R, R]. These increase intestinal permeability [R, R, R]. Tylenol, on the other hand, may even decrease intestinal permeability by increasing tight junction proteins in gut cells [R]. Make sure you are not deficient in vitamins and minerals required for proper gut barrier and immune function. These include vitamin A (retinol), vitamin D, zinc, iron, and B vitamins. Vitamin A lowered intestinal permeability in deficient children (DB-RCT, 79 children) [R]. Vitamin D maintains the intestinal barrier and, in fact, has been recognized as an intestinal permeability protector [R, R, R]. Vitamin D maintained low intestinal permeability in Crohn’s disease patients (DB-RCT, 27 patients) [R]. Vitamin D reduced the sensitivity of the intestinal barrier to alcohol in mice [R]. Niacin (vitamin B3) decreased intestinal permeability in patients with alcohol-induced niacin deficiency [R]. Zinc restored intestinal permeability in Crohn’s disease patients, probably by maintaining tight junctions [R, R]. In 12 Crohn’s disease patients in remission, those receiving zinc (10 patients) had normal gut permeability and did not relapse. Of the remaining 2 who had increased intestinal permeability, 1 relapsed [R]. 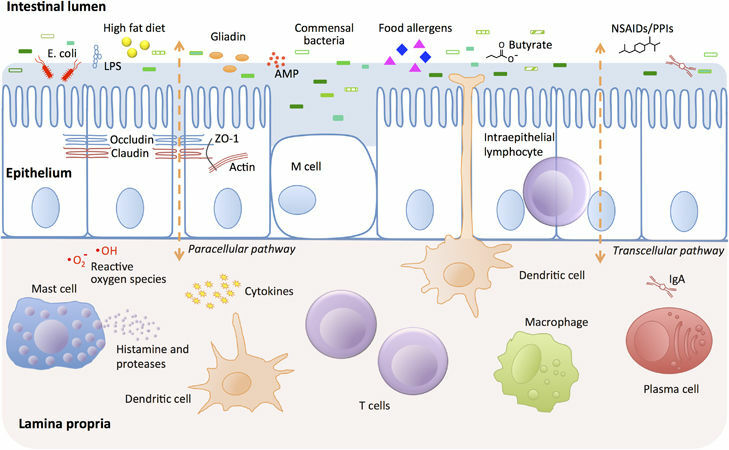 Low levels of zinc improved intestinal permeability in children with diarrhea (DB-RCT, 58 subjects) [R]. Glutamine is an important nutrient that helps maintain intestinal barrier function [R]. Depletion of glutamine results in a decrease of tight junction proteins and an increase in intestinal permeability [R]. Glutamine had beneficial effects on intestinal integrity in 101 preterm infants and increased intestinal barrier function in 80 malnourished children [R, R]. A study of 51 cancer patients showed that glutamine reduced the chemotherapy-induced increase in intestinal permeability [R]. Glutamine reduced radiation-caused gut injury and maintained gut permeability in rats [R]. Quercetin improves the function of the gut barrier by increasing the assembly of tight junction proteins [R, R]. Myricetin and kaempferol, which are similar flavonoids to quercetin, also improved intestinal barrier function in cell-based studies [R]. Quercetin protected the intestinal barrier from NSAID-induced damage in rats [R, R]. These flavonoids are naturally found in fruits, vegetables, nuts, berries, and teas, but are also available as supplements. Melatonin helps heal the gut barrier. Melatonin markedly improved gut barrier functions in rats, where the barrier was previously weakened by alcohol or diabetes [R, R, R]. Melatonin reduced elevated gut permeability in mice with IBD-like gut inflammation and in mice treated with NSAIDs[R, R]. Alcoholics have lower blood melatonin, which correlates with increased intestinal permeability (20 alcoholics and 17 controls) [R]. Lipoic acid supplementation reduced intestinal permeability in post-weaning rats [R]. Ginkgo biloba helped heal the gut barrier in rats by restoring tight junctions [R]. In rats, curcumin restored intestinal permeability by increasing tight junction proteins [R]. Curcumin helped with NSAID-induced increases in gut permeability in rats [R]. Given with antibiotics, curcumin improved intestinal barrier function in mice fed a Western diet [R]. Curcumin also protected tight junctions and barrier function in human cells [R]. Probiotics help reduce gut leakiness. They strengthen tight junctions and restore the integrity of the intestinal barrier. Plantarum promoted gut barrier repair and increased the stability of tight junctions (10 and 7 healthy subjects, respectively) [R, R]. Fermented milk with probiotics decreased gut permeability in patients with IBS (DB-RCT, 30 subjects) [R]. The probiotics included S. thermophilus, L. bulgaricus, L. acidophilus, and B. longum. Prebiotics are fibers that stimulate the growth of beneficial bacteria in the gut. Inulin-enriched pasta preserved the intestinal barrier and decreased zonulin (20 healthy volunteers) [R]. Prebiotic galactooligosaccharides (GOS) improved intestinal barrier function in rats with pancreatitis [R]. Prebiotics lowered intestinal permeability and improved tight-junction integrity in obese and diabetic mice [R]. Butyrate is a short-chain fatty acid produced by gut bacteria. It strengthens the gut barrier and reduces intestinal permeability [R, R, R, R]. Butyrate increased tight junction proteins [R, R, R]. Butyrate helped protect the intestinal barrier in rats with gut inflammation, and in mice fed a high-fat diet or exposed to chemotherapy [R, R, R]. Lubiprostone, a drug used to treat chronic constipation, may improve leaky gut in humans (28 subjects) [R]. The combination of neomycin and bacitracin reduced intestinal permeability in mice [R]. Intestinal permeability decreased after cefotaxime and vancomycin treatment in rats [R]. Tylenol may decrease intestinal permeability since it increases the levels of tight junction proteins in gut cells [R]. THC and CBD oil accelerated the recovery of inflammation-induced intestinal permeability in cells [R]. Systemic (whole-body) inflammation is associated with increased intestinal permeability [R, R]. Addressing inflammation will help heal leaky gut. Chronic infections can increase gut permeability, and are best dealt with if possible [R, R, R, R, R]. HLA-DQ is a protein found on the surface of cells that communicate with the immune system (it presents antigens to immune cells). Two variants, HLA-DQ2.5 and HLA-DQ8.1 increase the risk of celiac disease by about 6-fold [R]. In 98% of people with celiac disease, they have either of these genes or both [R, R]. Up to 40% of the general population has these variants. However, only about 1% develop celiac disease. This indicates that HLA-DQ2.5 and -DQ8.1 variants are necessary but not sufficient for disease development [R, R, R]. Because of this, the primary value of genetic testing is to rule out celiac disease/gluten intolerance. If you are among the 60% of people who do not carry either of these variants, you are likely (>95%) to not be at risk. That means that you can avoid unnecessary invasive test procedures, such as blood punctures, duodenal biopsies, etc. [R]. Apart from celiac disease, having either HLA-DQ2 or HLA-DQ8 increases the risk of type 1 diabetes. Having both of these variants increases the risk even further [R, R]. Women with a history of recurrent pregnancy losses are more often carriers of HLA-DQ2 and DQ8 variants (97 patients and 55 controls) [R]. Three of these variants are associated with IBD: rs1545620, rs1457092, and rs2305764 (meta-analysis; 10 studies, 8,975 cases, and 9,482 controls) [R]. The rs1545620 and rs2305764 variants are also associated with celiac disease (2,717 IBD patients and 4,440 controls and 3,463 patients and 686 controls) [R, R]. The association of MYO9B variants with celiac disease was confirmed in other studies [R, R]. However, some also failed to find an association (415 CD patients and 433 controls) [R]. rs2279003 and rs2305764 may increase the risk of type 1 diabetes (316 patients and 706 controls) [R]. rs1457092 was associated with lupus and rheumatoid arthritis (349 lupus patients, 356 arthritis patients, and 345 healthy controls) [R]. NOD2 (also known as CARD15) functions as an “intestinal gatekeeper.” This protein recognizes bacteria, viruses, and parasites, and activates the immune system. It also helps shape our gut microbiota [R]. In healthy relatives of Crohn’s disease patients, 40% of those with the 3020insC and 75% of those with both 3020insC and R702W had increased intestinal permeability [R]. 3020insC (either rs2066847 or rs5743293) was associated with increased permeability in 75% of multiplex and 61% of the sporadic Crohn’s disease patients (115 patients, 127 first-degree relatives including some with sporadic disease, 19 healthy controls) [R]. Janus kinase-2 (JAK2) promotes the growth and division of cells, in response to hormones and cytokines (interferon, erythropoietin, leptin, and growth hormone) [R]. IBD patients carrying the JAK2 rs10758669 (C) variant more often have increased intestinal permeability (464 Crohn’s disease patients, 292 ulcerative colitis patients, 508 controls) [R]. HP is the haptoglobin gene. Haptoglobin binds free hemoglobin in the blood and prevents it from causing oxidative stress and tissue damage. It comes in 2 common variants: Hp1 and Hp2. It was discovered that prehaptoglobin-2, a precursor of the Hp2 variant, is actually zonulin [R, R]. Therefore, people with Hp2 variants may have an increased risk of immune and inflammatory disorders due to higher zonulin and increased intestinal permeability [R]. MAGI2, MAGI3, and PARD3 are tight junction proteins. IBD is associated with rs6962966 in MAGI2 and rs1343126 in MAGI3 [R]. rs10763976 in PARD3 and rs6962966 in MAGI2 are associated with both celiac disease and ulcerative colitis [R]. AHR (aryl hydrocarbon receptor) is a protein that activates detoxification enzymes in response to pollutants and cancer-causing agents. It also plays an important role in activating the immune system [R, R]. AHR rs7796976 (G) increases the risk for disturbed intestinal permeability in Crohn’s disease patients. Smoking can exacerbate this effect (28 IBD patients, 4 controls) [R]. You might consider listing the therapeutic dose for neutraceuticals. So the amount, doses, and number of days. It also would be good to indicate the strength of the evidence, and the expected impact. I know that’s not always possible. Interestingly enough, all the above symptoms were also linked to RoundUp use and GMOs. Great protocol & thank you. I’ve had to omit the L-Glutamine because of neuro injury/inflammation and added Restore by Zack Bush with good effect. Can’t speak highly enough of the infrared lamp = i’m under it for apx 3 hrs per day for all injuries including LGut. you no longer can make enough….. Explains the Leaky gut! I read that you can’t use collagen and it must break down to amino acids first then you have to make it but that is NOT how this felt….it felt like my body used the collagen to repair immediately! I want to add a parasite cleanse….think everyone has parasites now and that can help too. Now….if Only Someone will begin Cell Culture Collagen…..no hormones…contaminates No Cruelty! The world will Need this as our Vegan and Vegetarian young people age and also lessen in ability to make their own collagen! All plant substitutes can only provide the building blocks, but even provided everything that is needed….as the body ages it just can’t make enough. If any of you know someone who can begin Cell Culture Collagen please ask them to develop this life saving product! Very good article. It would be interesting to know how much Roundup (glyphosate) plays a part in all of this. Joe, you’re undoubtedly one of the most brilliant people I’ve ever had the good fortune to discover! April can you tell me were to purchase your regimens please? Im suffering from the exact same thing. Isabella, there are numerous formulas that can be found in most health food stores, but the one I am particular fond of, because it works, is Nature’s Answer Black Walnut and Wormwood Combination Extract. It’s is an alcohol and gluten free liquid. I followed the instructions on the back of the bottle, which is to take between 28-56 drops, 3 times a day for 10 days. I then take a two week break and start up again. Hope this helps you in your quest for wellness! April, could you please share the regimen for the mixture of Black Walnut Hull, Wormwood, Clove and Sweet Annie you used for your parasite cleanse. Are these taken as capsules/supplements or as a tincture? My original comment of considering parasites as a cause of leaky gut never showed up, so I’m attempting to leave another comment. There is light mention of them in this article, but I think they deserve serious consideration. My leaky gut diminished greatly after going on a parasite cleanse. The only thing I would add id that people with autoimmune conditions may delay probiotics until their leaky gut is healed. There is a risk of probiotics causing a serious infection when taken too early in the process. The previous comment was in reply to Alex mentioning Bone Broth. Yes. I am wondering why this was not mentioned, along with info about various sources/types of collagen and their potential benefit for healing leaky gut and modes of action. Because we couldn’t find any studies to back up collagen/bone broth (in intestinal permeability) scientifically. If you find some, please share the links and we will add them. My gut flora were obliterated in 2009 from a high-dose combo of Cipro and Prednisone that were scripted to me after I had an allergic reaction to food, which I’ve never had previously in my life. 3 days after those meds and my old life was over. I was a new sick and nearly dead shell of whom I’d been all my life. Tried treating it with everything listed in this article. Re-culturing refused to take hold, flora would not re-establish. I have Lyme, Epstein Barr, Candida and live in Mold. I also have every expressing genetic mutation that leads to leaky gut, including MTHFR, G6PD, COMT, confirmed Celiac Sprue and others. I was diagnosed with IBD. Been treating all those things for years, to no avail. Nothing would heal my gut. I decided to do a liquid parasite cleanse with only 4 ingredients: Black Walnut Hull, Wormwood, Clove and Sweet Annie. Wouldn’t you know, the pain stopped, inflammation and bloating (like a 9 month pregnant woman) deflated and I’m finally losing weight after struggling for 5 years. My heart palpitations went away, and my energy and passion for life is restored. I was not tested, so I don’t know what kind of parasite I had, but I’ll be doing these cleanses as often as I can. For me, personally, whatever the thing was that destroyed my gut, is now being destroyed by the parasite cleanse, and I finally feel like I am alive again! Including parasites as a major cause of leaky gut is worth serious consideration, and treatment, if nothing else is working. Be well. I had a very bad case of SIBO and leaky gut in 2015. It was extremely painful and I developed severe food intolerances to things like milk and corn proteins, foods which I previously had no problem with. I healed it using lots of L-Glutamine, Colostrum, prebiotics (“Prebiotin”, contains inulin), very strong homemade probiotic yogurt (made from probiotic capsules – not the usual yogurt strains), and fish collagen. I also shined a 300 watt far infrared light on my stomach area for 1-2 hours a day. It took several months of intensive healing, but it worked.